Details Malachite the mineral is basic carbonate of copper, usually described as a bright greenish blue or sometimes as a pale green. Our malachite is obtained from mines in Nizhniy Tagil, Ural Mountains, Russia. This malachite is a fine grade with an average particle size of 20 µ that exhibits a light green masstone with a slightly yellowish undertone. Alternate Names: It is also known as copper green, green bice, and green verditer, although these names are usually given to the artificial pigment. It is a historical pigment having been found in Egyptian tomb paintings as early as the Fourth Dynasty (sixth century B.C.). It received sparse mention in medieval literature probably because it is more commonly found in egg tempera paintings than in European oil-resin easel paintings and often associated with the mineral azurite. Malachite is basic copper carbonate found in many parts of the world in the upper oxidized portions of copper ore deposits. Notable occurrences include many classic mineral localities such as Shaba, Congo; Tsumeb, Nambia; Ural Mountains, Russia; Mexico; several sites in Australia; England and several localities in the Southwestern United States especially in Arizona, USA. Malachite is a secondary mineral of copper, which means it is formed when copper minerals are altered by other chemicals. It occurs when carbonated water interacts with copper minerals, or when a solution of copper interacts with limestone. 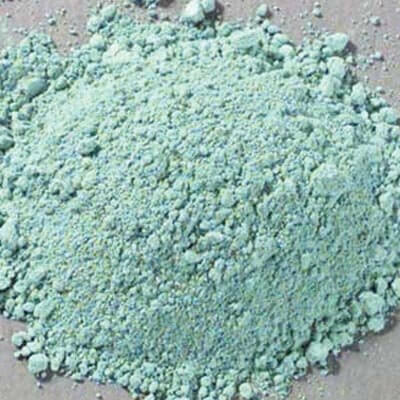 Available from Natural Pigments in two grades or fineness of grind; fine and coarse, which produce corresponding light and dark tones of green when used in aqueous medium. This malachite is a fine grade with an average particle size of 20 µ that exhibits a light green masstone with a slightly yellowish undertone. Malachite has often proved to be permanent in oil paintings, although it may acquire a dull, brownish hue owing to the darkening of the oil. It is unaffected by exposure to light. In theory copper carbonate is blackened by sulfur compounds, so it may be affected by exposure to hydrogen sulfide found in polluted air. to It is said to be incompatible with sulfide pigments, such as cadmium yellow, orpiment, realgar ultramarine, and vermilion. Even though theoretically subject to blackening when mixed with sulfide pigments, in practice this has never been reported. In tempera paintings, according to A. H. Church [Chemistry of Paints and Painting, p. 200] it is found to have stood well. Malachite passages on Italian frescoes are often still bright green. No data has been published on the oil absorption properties of malachite. 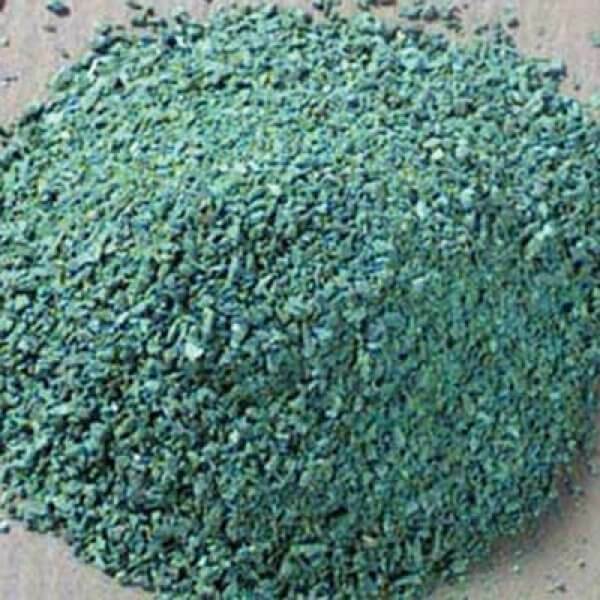 To be useful as a bright green it must be ground relatively coarse, because, if too finely ground, it becomes too pale for practical use. Cennino Cennini remarks that "if you were to grind it too much, it would come out a dingy and ashy color." He recommends grinding it in water; and "when you have got it worked up, put it into the dish; put some clear water over the color, and stir the water up well with the color. Then let it stand for the space of one hour, or two or three; and pour off the water; and the green will be more beautiful. And wash it this way two or three times, and it will be still more beautiful." Being moderately low in refractive index, it may be more useful in aqueous medium, such as tempera, than in oil-medium. However, wonderful results have been achieved with this pigment in oil. Malachite is moderately toxic and care should be used in handling the dry powder pigment to avoid inhaling the dust.